“What to eat in Japan” is a question on the mind of any traveler here, but the answer is more complicated than it seems. To a large degree what to eat depends on the traveler’s tastes, but no matter the visitor’s palette, a well-rounded meal plan should be the goal of anyone looking to get a good taste of this county. What you eat in Japan should be an extension of the country itself, and its food should give you just as good an idea about its culture as any shrine or castle. 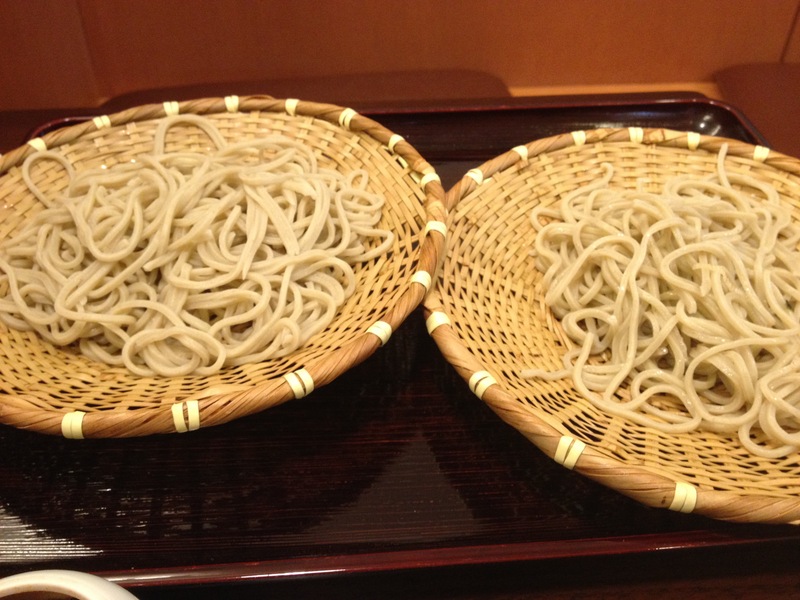 Soba is the quintessential Japanese noodle. When non-Japanese think of Japanese food, the first thing that comes to mind is usually sushi, but soba is arguably even more “Japanese” than the world’s favorite raw fish. It’s also as deceptively simple. Cold soba is nothing but buckwheat noodles and dipping sauce with sliced green onions and wasabi. But any foodie knows that simple doesn’t equal plain. The best meals in the world are simple recipes prepared exactly the same way they have been for hundreds of years. Soba exploded in popularity during the Edo period, in the middle of the 17th century. It was said that there was a soba shop on every block. They were like French coffee shops. After a meal you would add water to the dipping sauce and drink it like coffee as you watch the crowds flitter by. A lot of soba shops in Japan are still like that–nodules on the map for a salaryman to relax and get some sustenance before going home to bed. But if you’re visiting Japan, try to find a soba restaurant that makes the noodles by hand and you’ll find some of this country’s best food fare. There will usually be a window in the building’s front where you can watch the master knead, mix, roll, and cut the dough into the noodles. Soba prepared the old-fashioned way is a real treat, and as authentic Japanese cuisine as you can get. I recommend zarusoba, cold noodles over a sheet of bamboo, since putting them in broth will affect their taste. Mix some wasabi and green onions into the dipping sauce and you’re set. 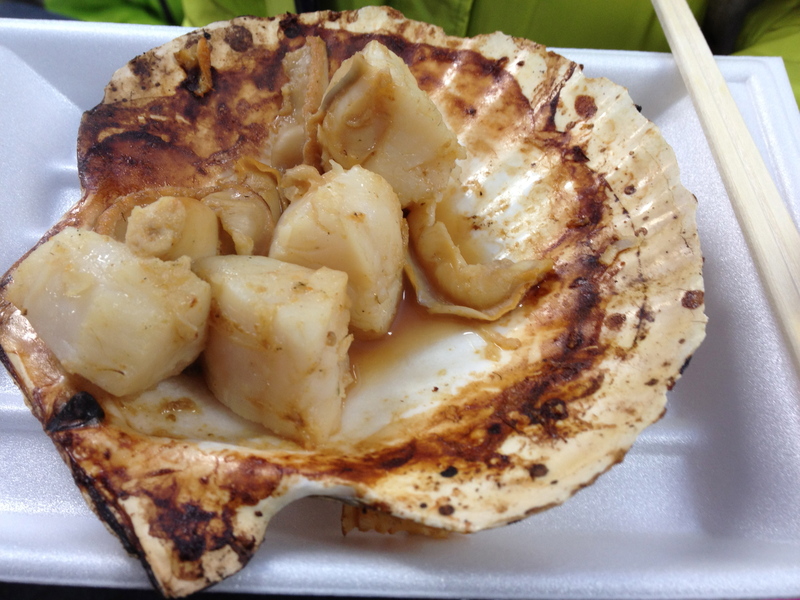 Chinmi are local specialties. If you go anywhere in Japan and ask the locals what to eat, the first thing that comes out of their mouth will be the chinmi. Everywhere has one, and sometimes more. Yamanshi, for instance, is known for its hoto, a thick noodle porridge that has spawned one of the biggest local chains around here, Kosaku. But the capital city, Kofu, has its own specialty called torimotsuni, which was a winner in the B-1 Grand Prix, a national competition for B-grade chinmi. Torimotsuni is chicken organs. I’ve had it, and like most chinmi, it’s okay if you eat it at a place that made it famous. Noodle porridge and chicken organs may not appeal to all palettes, but most places’ chinmi are what to eat in Japan. 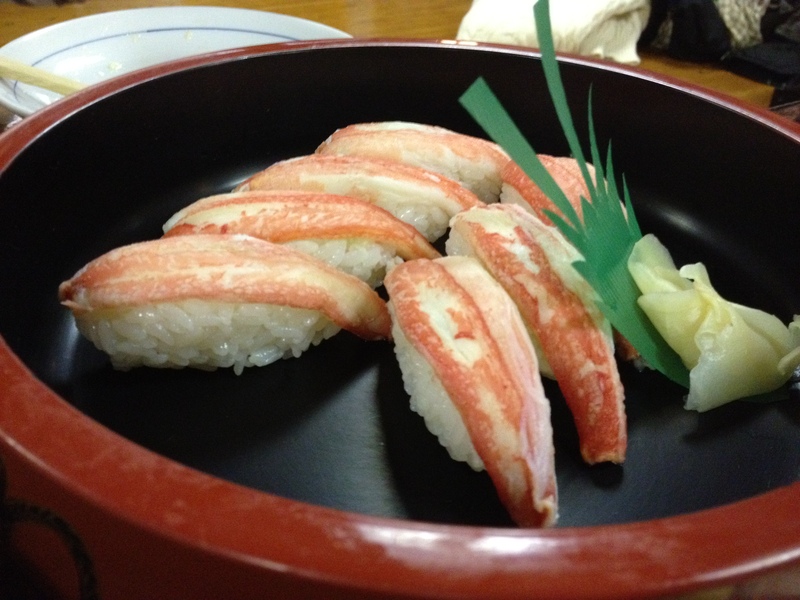 Hokkaido is famous for its crab and ramen, both of which are every bit as delicious as locals say. Hiroshima’s chinmi, its own style okonomiyaki, was one of the best meals I’ve had in this country. Wherever you go, the chinmi is one of the first things you should eat. Kaiseki ryori is Japan’s haute cuisine. A lot of places will tell you that kaiseki ryori is Japan’s traditional cuisine at its finest, and maybe it is, but it’s more of a composite of many traditions than one with a continuous history. In it’s earliest incarnation, and I use the word loosely, it was a plain meal created by the ancient tea ceremony master Rikkyu to attach significance to the hospitality food conveys rather than how luxurious it was. From there it evolved into almost the complete opposite. 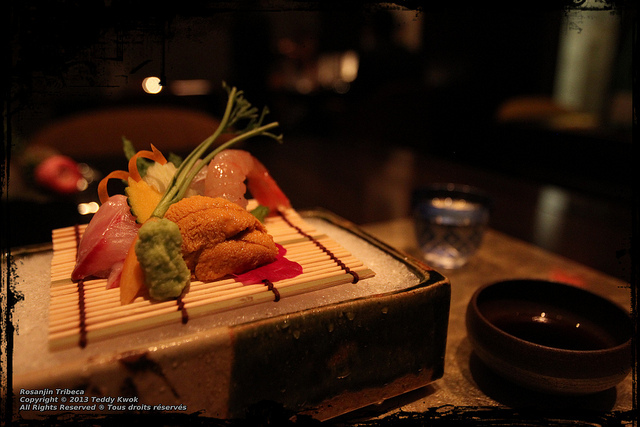 From its humble origins, Japanese chefs incorporated the traits of various food traditions until kaiseki became what it is today: one of the most extravagant and expensive meals you can eat in Japan. A kaiseki meal will be composed of upwards of 14 sequential dishes, all drawing from different parts of Japan’s traditional food culture. It’s expensive, with dinner prices ranging from $150 to upwards of $350 USD. (Though you can find it cheaper in some places.) But if you are visiting Japan, and not on a budget, it’s worth dropping the cash on what is considered the pinnacle of Japanese cuisine. 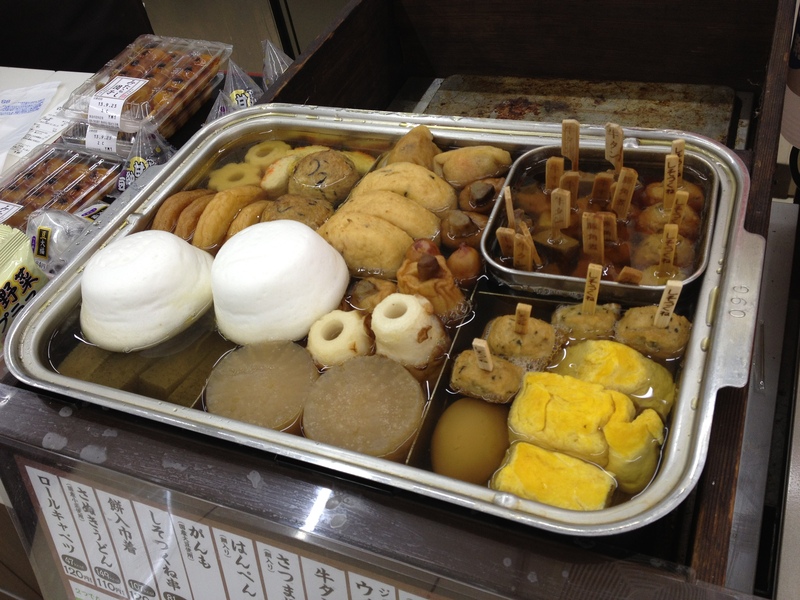 Oden is Japanese street food. It’s a winter dish consisting of many separate foods stewed in dashi broth. Since it’s presented in a sectioned pot, you can choose what you want the vendor to dig out for you. It’s sold at street carts and convenience stores across Japan. Many convenience stores sell items for around ¥70, about 55 cents USD, making it by far the easiest and cheapest traditional Japanese food visitors can try. Originally, oden was mainly boiled tofu or konyakku, but over the years a lot of other foods have been added to the blend. Honestly, the first time I saw it I thought everything looked kind of plain, but it had more flavor than its appearance suggested. What I like to eat is the daikon with a dash of karashi mustard, but there’s a lot of different kinds of oden, so definitely try out whatever strikes your fancy. Living somewhere between western and asian cuisine, it’s the prefect example of how Japan is not isolated in its food culture. Many of its dishes are imports from abroad. It’s also a small glimpse into some of the issues surrounding Japan’s self-identity. Strips of meat grilled over a small, often portable grill is familiar yet deliciously foreign. Since you order yakiniku by the cut of beef, it also gives you a better appreciation for each part of the cow. You can really taste the difference between each section. As long as you’re willing to cook your own food, yakiniku is the perfect meal to convince the doubter that Japanese food has a lot to offer. As far as being multi-cultural, yakiniku is broadly considered Korean in origin. 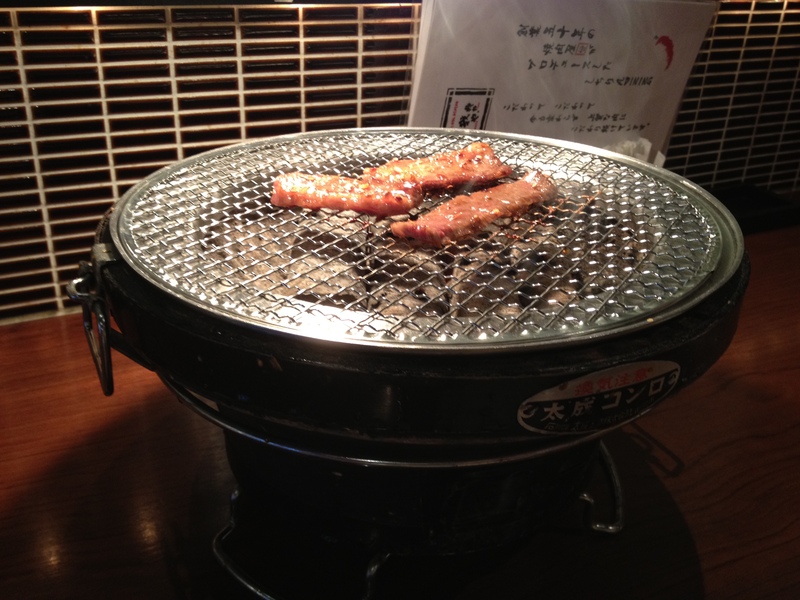 The term “yakiniku” itself was developed after the Korean war divided North and South. The word was used to identify the style of cooking without referring to which part of Korea the dish came from. But while yakiniku’s roots are generally thought of as Korean, one program on Japan’s state-run broadcast channel, NHK, stated unequivocally that “while some tend to think yakiniku came from Korea, it was born in post-war Japan.” I haven’t seen the episode, but I’m assuming the reasoning is the claim that the dish was developed by Korean restaurant owners living in Japan who modified the Korean dish “bulgogi” to suit Japanese tastes. If true, this would make its birthplace Japan and lend credit to the statement above. Regardless of where exactly yakiniku came from, though, even something as irrelevant as barbecued meat can have a TV show devoted to deciding how “Japanese” it really is. It’s part of a broader issue of how for a minority of Japanese there is a strong need to reinforce Japan’s positive self-identity. When you try yakiniku, you’re trying a slice of Japan’s multicultural cuisine as well as a delicious example of how some people can make a controversy out of anything. Nabe means “pot.’ It’s a hot pot dish you cook at the table. There are two kinds of nabe, a light stock that focuses on the flavor of the ingredients, and another with a stronger stock like miso or soy sauce. Within those two broader categories you can get a range of ingredients, from seafood to beef, all including many different vegetables. Nabe is usually a group affair with everyone picking what to eat out of the pot. Why I highly recommend trying nabe is because it’s a good glimpse into Japanese home cooking. Aside from being offered in restaurants, nabe is served at dinner tables across Japan. It may be fancied up in restaurants, but originally it was just when mom threw all the leftovers in a pot and cooked. 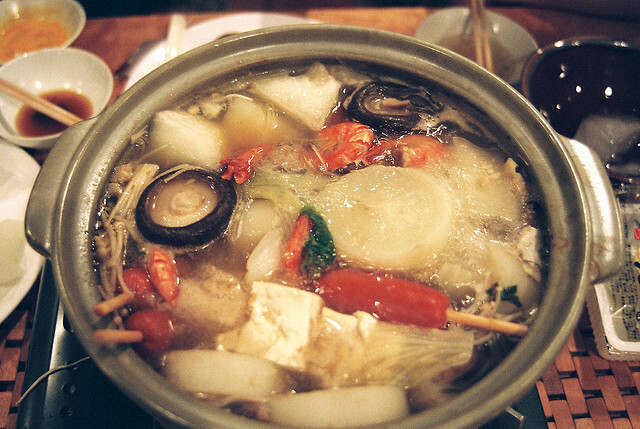 If you’re going to try this traditional dish, try the motsu nabe. Motsu means, roughly, innards. That probably sounds bad to a lot of people, and I’m no bigger a fan of innards than the next guy. But I’m also not one of those travel TV show hosts who scarfs down disgusting food for entertainment. When it comes to nabe, take a step outside your comfort zone and try the motsu. You will thank me for letting you in on this wonderful, if bizarre, prize of Japanese cuisine. Real ramen does not come in square, dehydrated packages. Authentic Japanese ramen is one of the best foods to eat here. It’s the working man’s meal, a quick, dirty bowl of delicious noodles you get at shops ripe with a pleasant “local’s only” atmosphere that ensures the chef knows what he’s doing. There are many kinds of ramen, but it comes down to broth: soy sauce, miso, salt, or tonkotsu. Go with miso if it’s your first time, because it’s really hard to mess up miso ramen. The best ramen I’ve ever had, though, was soy sauce. There’s also some very good tonkotsu ramen, but it’s hit or miss in my experience. I don’t generally prefer salt ramen because it’s a little too thin for my tastes. Ramen immigrated to Japan on the heels of the British and Dutch who moved here from China. They brought their Chinese servants with them, and these servants brought ramen. The restaurants they set up began selling “shina soba,” which was later renamed “chuka soba” to be more politically correct. (“Shina” was derogatory.) The word “ramen” only came into popular use after the instant noodles we all know an love hit stores, but you can still see quite a few ramen shops touting “chuka soba” signage. 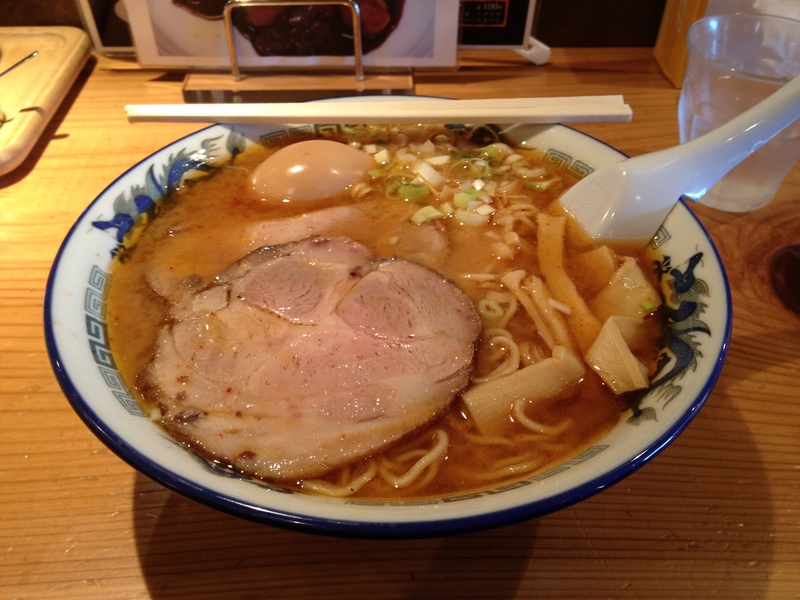 It may come from abroad, but ramen is one of the most important foods in Japanese cuisine. Coming to Japan and not eating ramen is like going to the US and not eating a hamburger, or England and not trying fish and chips. Traditional foods like sushi may be at the heart of Japan, but ramen is at its gut. 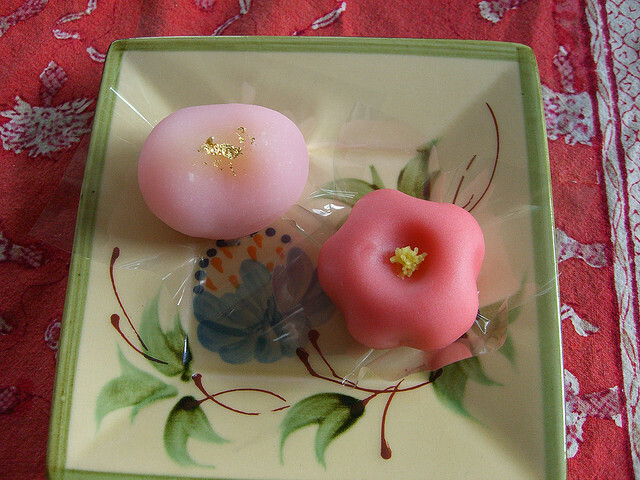 Wagashi is the word for Japanese sweets. Sugar made its way to Japan from India in the Muromachi era, but the invention of wagashi really took off in the later Edo period. But with some of its roots tracing back to the ancient imperial court, wagashi are often very decorative, and aesthetics are just as important as taste. Based off anko (azuki bean paste with sugar,) and mochi (pounded sweet rice,) they generally have a milder taste than western sweets, and, going well with green tea, have been integrated into the traditional tea ceremony. Among Japanese there is a social responsibility to get friends, coworkers, teachers, neighbors, family, basically everyone, souvenirs when you go on a trip. So many souvenirs being passed around can start to pile up, so most people prefer edible ones. Many train stations have a nearby shop that sells the local wagashi, which is usually another kind of chinmi. Maybe the most famous is the yatsuhashi in Kyoto, considered a must for any visitor to eat. Japanese cuisine prides itself on its wagashi, so they are definitely with a try. 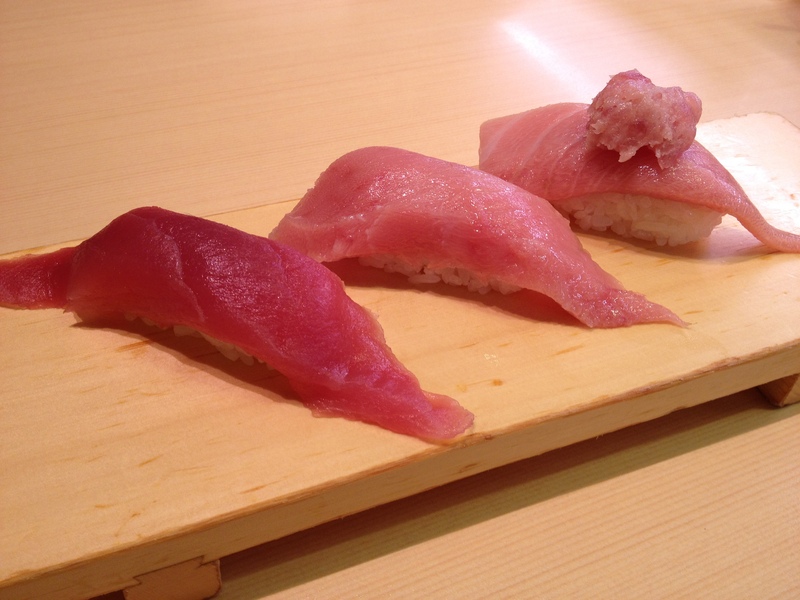 It goes without saying that authentic sushi is at the top of the list of things to eat in Japan. All I have to say is that besides eating in an expensive bistro, also try the kaitenzushi, (conveyor belt sushi.) For me, it’s a more relaxed and overall better experience. If that sounds interesting, I wrote about it before here. You’d have to stay for weeks to really get a grasp on Japan’s rich food culture, but even a short-term visitor can enjoy what Japan has to eat. Some of it may put a dent in your wallet, but the good news is that a lot is really affordable. There’s obviously a lot more than what I mentioned here, but if you at least check out these dishes, then you’ll have a good idea of what to eat in Japan. whether in Japan there are chili, never i see that? Soba used to be my favourite but after I visited Japan, Ramen took over my palate. My Kaiseki Ryoryi experience was unforgettable while my gluttony in an Oden buffet put me off them for a while 🙂 Unfortunately though, I have not had the chance to try Chinmi! Why didn’t anyone told me?! Guess I have to go back to Japan again!